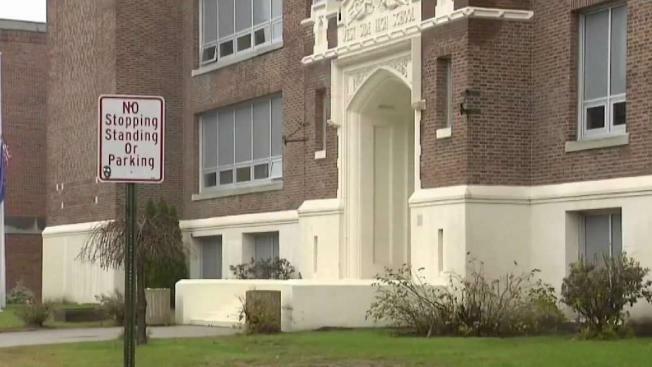 Police in Manchester, New Hampshire, are investigating a deadly shooting across the street from a high school. Authorities in Manchester, New Hampshire, are investigating a shooting that killed a 24-year-old man Monday evening. The victim, identified as Dillon Schultz of Derry, was found inside the front door of 6 Notre Dame Ave., steps away from Manchester West High School. It was 6:30 p.m., and parents say students were roaming the streets. "It's scary, just even a stray bullet or something like that," said Stan Kulgowski who has a son who goes to West. His wife, Jenny, couldn't believe it when she heard the news that the victim was shot and killed just across the street from where her son goes to school. "He had a long time to live, he died too young," she said. William Picarro lives in the apartment building and was home when someone opened fire. "We just heard a gun pop and people running," Picarro said. "We locked the doors, you know what I mean, for safety." It was chaos inside and outside. As police rushed to the shooting, two cruisers collided, sending those officers to the hospital. Back at the scene, authorities found Schultz suffering from a gunshot wound. He was rushed to a nearby hospital, where he later died. Detectives are now trying to figure out what brought Schultz to Manchester. "Why Mr. Schultz was there, who he was going to see, or whether he was leaving from visiting someone, or something, that's still under investigation at this point," Senior Assistant Attorney General Benjamin Agati said. Authorities say despite the proximity of the crime to the school, students were never in danger. But still, Kulgowski says he's had enough. "More murders and shootings and drug activity make me not want to live around this area," he said. The officers involved in the crash are expected to be OK. The AG's office announced Wednesday that an autopsy determined the cause of Schultz's death to be a gunshot wound to the abdomen. The manner of death was homicide. Anyone who was in the area between 5 p.m. to 6:45 p.m. and anyone with information on the shooting is asked to call the Manchester Police Department Detective Unit at 603-668-8711. Anonymous tips can be made at 603-624-4040.